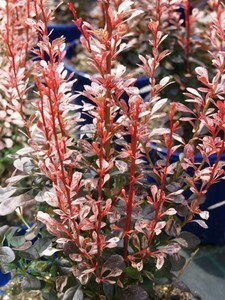 description for "Deciduous: Berberis thunbergii 'Rosy Rocket' PP18,413"
'Rosy Rocket' Barberry boasts attractive new foliage that features the same beautifully dappled rose-red colored leaves known to 'Rose Glow', maturing to deep burgundy. Upright, columnar habit and outstanding foliage make this a wonderful highlight to any garden. Plant in full sun for best color. Grows to a height of 4 feet with a spread of 15-18 inches. Zones 4-8. Edited by M.Tate. reviews for "Deciduous: Berberis thunbergii 'Rosy Rocket' PP18,413"